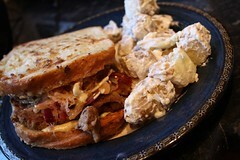 This sandwich is very special because I’ve taken influences from 4 of my very favourite ladies. You know how you can read recipe books as many times as you like but one time you’ll still spot something and you’ve got no idea why you’ve never made it before? I have absolutely no idea why I’ve never made the Monte Cristo Reuben from 500 Vegan Recipes before (2 of my favourite ladies, Celine and Joni, wrote it). I love any form of Reubens and when Matthew had a Monte Cristo in Chicago Diner I determined to make one. Since then I have actually tested another version for Hearty Vegan so it’s even more bewildering that I haven’t made this before. I didn’t make it exactly as written. For the seitan I used a corned version from Tami, and with the onion and sauerkraut I took a tip from Kim and threw in a chopped jalapeno. I made a sort of version of the suggested curry aoli in the same book to spread on the bread. I served it alongside the horseradish potato salad from Vegan Diner (I’m loving this newish book and hoping to cook enough from it to do a review soon). Wow. What a dinner. Even I couldn’t eat it all and left some crusts. Extremely decadent; you wouldn’t want to eat like this every day. I was so full afterwards I was groaning and couldn’t even find room to finish my wine! But for an occasional treat it was an absolute winner and made all the better because it reminded me of some of my favourite people. …and this is what I want you to make me when I visit. I’ve often read about Reubens, but have never made one before. I think I must investigate these further! They seem to be a sort of sandwich? What makes them a Reuben? An enjoyable bit of research awaits me! This one certainly looks and sounds delicious! I could tell you the nasty but kind of funny story of a guy I went to school with whose name was Ruben, but I try not to think about it when I try to eat or when I look at pretty pictures of food. so I won’t. I can’t believe I’ve never made that sandwich either! We should start a blog “For the Love or Rueben” and blog every reuben we ever have. I mean ‘of’ not ‘or’. I just recently started making vegan reubens. 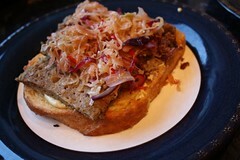 I made the Fork-and-Knife Reuben out of American Vegan Kitchen and it was DA BOMB! I have 500 Vegan Recipes. I have never seen this recipe. I’ll definitely be trying this one! It looks delish!